Marco Scutaro's RBI single in the 10th inning provided the winning margin. 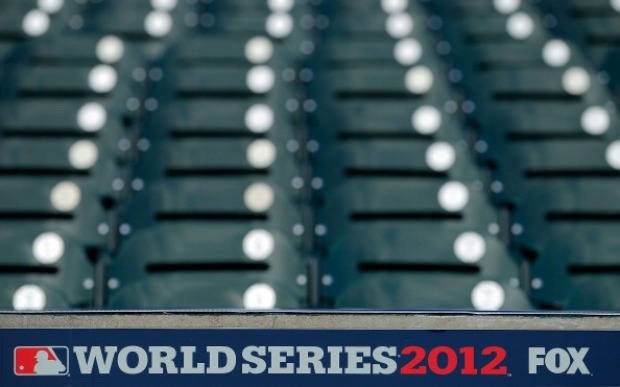 For the second time in three years, the San Francisco Giants are World Series champions. Marco Scutaro hit a bloop single to shallow right center in the 10th inning to score Ryan Theriot and closer Sergio Romo came on to close out the 4-3 win. This year's championship has a decidedly different feel than 2010, when the team put to bed 52 years of frustration by winning its first championship since moving west from New York. For many Giants fans, that title was classified as a "now I can die happy" achievement. This one shows the team was more than just a flash in the pan. Let the dynasty talk begin. Unlike the first three games of the series, the Giants weren't in control throughout in the clinching game. They took an early 1-0 on a RBI triple from Brandon Belt which scored Hunter Pence in the second, but that lead didn't last long. Miguel Cabrera, who was 2 for 9 without an extra base hit in the first three games, hit a 2-run, opposite-field homer to right in the third to put the Tigers up 2-1 and give them their first lead of the series. It represented the first deficit San Francisco had faced in 56 innings. It figured to be only a matter of time before Cabrera, the American League triple crown winner and likely MVP, made some impact on the series. an opposite field solo homer to right to tie it back up. The victory finished one of the great runs in baseball history. In winning their final seven games of the playoffs, the Giants outscored their opponents 35-7, including 15-6 during their four-game sweep of the Tigers. Starting pitcher Matt Cain's performance was historic in its own right. He had a chance to become the third pitcher in baseball history to earn the win in three clinching games during the postseason, but left after allowing three runs in seven strong innings to earn a no decision. It was still the type of performance that Giants fans have come to expect from the horse of the staff -- especially in the postseason. The Giants made Cain the highest paid right-handed pitcher in baseball history before the season began with a six-year contract worth $127.5 million and the investment paid immediate dividends. He also tossed the first perfect game in franchise history and started the All Star game. Jeremy Affeldt relieved Cain in the eighth, and after allowing a lead off walk, he struck out Cabrera, Prince Fielder and Young in succession. He got another two outs in the ninth before giving way to Santiago Casilla, who got the final out of the ninth before Romo came on in the 10th. After the Giants' win in Game 3, the championship was all but assured. Never before, in 23 previous occurrences, had a team failed to win the World Series after taking the first three games of the series.